It was given to me on my birthday by two dear friends of mine (great taste ladies). I love this book, the title is perfect. 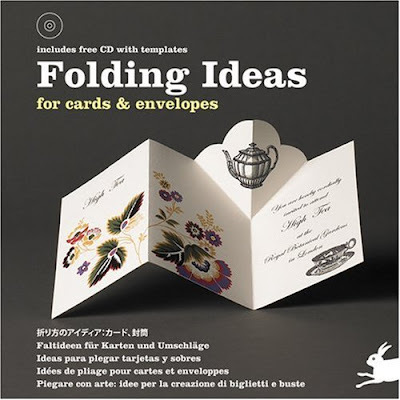 Is not just cards ideas, but envelopes, pop-ups, locking devices, frames and windows and simple folds. All the ideas featured in this book are beautiful and unique and for every occasion. It is very straightforward, you don't' read the instructions, but rather you follow the illustrations, which are easy to see. The book gives you templates on the book and the best part is that it comes with a CD included with the files of the templates so you can print them out. The CD also contains graphics if you want to decorate the idea you plan to fold. A proud member of my library. "I doodle, therefore I am. I sketch, therefore I am. I illustrate, therefore I exist"